Half-duplex communication may be likened to two tin cans on the ends of a single taut string: Either can may be used to transmit or receive, but not at the same time. Full-duplex communication is more like a true telephone, where two people can talk at the same time and hear one another simultaneously, the mouthpiece of one phone transmitting the the earpiece of the other, and vice versa. 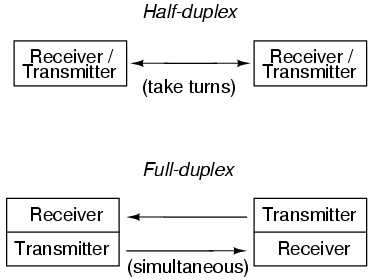 Full-duplex is often facilitated through the use of two separate channels or networks, with an individual set of wires for each direction of communication. It is sometimes accomplished by means of multiple-frequency carrier waves, especially in radio links, where one frequency is reserved for each direction of communication.